Time for another Friday Mashup, where the heck did the week go? This weeks challenge is brought to us by Heidi. I have to say, I learned something new with this challenge. Heidi wants us to create a "Scrapling" or a project that uses scraps of ribbon and DSP. I had never heard of a scrapling before so I read Heidi's description, and then watched a video on Youtube(thank you to all the stampers that have the patience to make videos so visual folks like me can learn!). It's a cute little thing, and I could see myself making some of these at Christmas as tags. I did Mashup the challenge and used scraps of DSP and ribbon on my scrapling. I'm not a fan of pink so this was a good way to use up scraps of pink paper I have laying around, that normally wouldn't get used. Make sure you head over to The Friday Mashup blog to see the rest of the projects from the rest of the design team. Also, I am REALLY behind on commenting so please be patient with me, I'm not purposely ignoring anyone! Long days at work and having my kids home on summer break means very little computer time right now for me. A scrapling is a little card, notecard, or tag that you would make out of the scraps that are left from your card stock after making a square card. What do I mean? If you started with an A2 card base, 4-1/4 x 5-1/2", and then cut it down to make a 4-1/4" square card, there would be a 1-1/4 x 4-1/4" base left. That's the starting point for your scrapling. It could also be 1-1/2 x 4-1/4", if you had made a 4 x 4" square card previously. It is lots of fun to decorate this small space! Make a project using " Scraps of Pattern Paper or Ribbons ". Or Make a " Scrapling ". 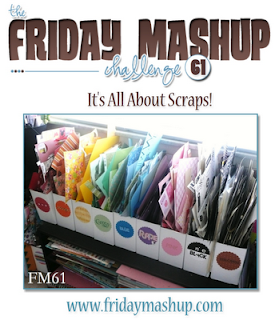 Or "Mash it Up" and create a " Scrapling using Scraps or Pattern Paper or Ribbons. ". cute, cute, cute! I have never heard of a scrapling either. These are so sweet! 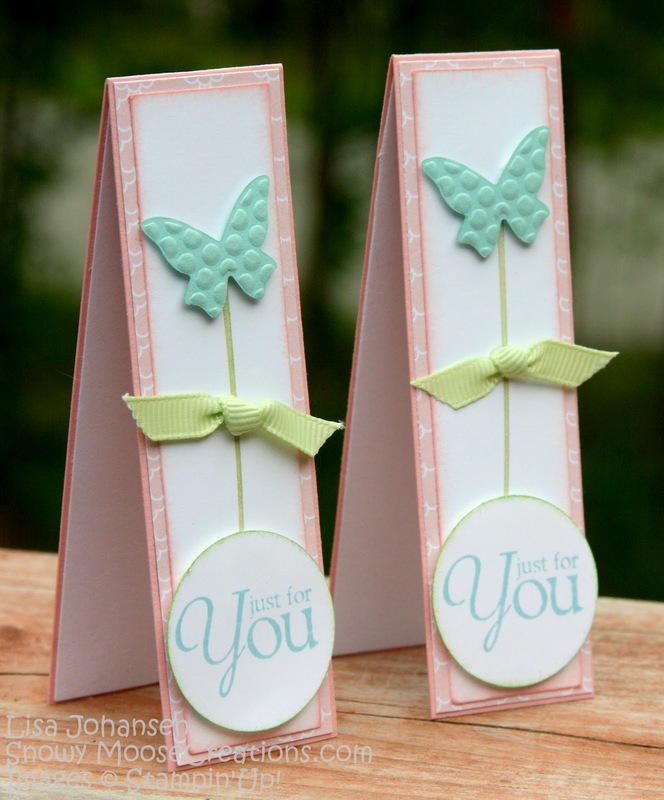 I could see these being used as bookmarks - great to pop in with a matching card as a little extra something... TFS! Oh how fun. I hadn't heard of a scrapling before but I love using scraps so thanks so much for sharing this wonderful idea. Very cute! I love how the butterflies look like flowers or lollipops! I had never heard of scraplings, but I think these are adorable. With magnets on the inside, they would make excellent bookmarks. Love the butterfly "flowers" and the soft colors. Adorable.. I love those butterflies.. Great Scrapling Lisa! OK, these are too cute for words! Love your little scraplings! These are so cute! I love the butterflies and just everything about these! They would make gorgeous gift tags!